There’s that small moment of “oh oh” when you notice that your pee is not part of the acceptable pantone colour chart for bodily waste. This thought is immediately replaced by “emergency doctor’s appointment” until my brain finally kicked into gear and settled on the correct answer, “too much beetroot for lunch”. 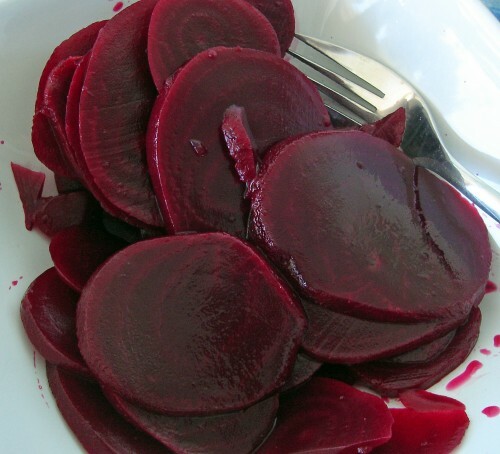 I love beetroot, I could eat an entire family-sized pickled beetroot jar in one sitting if I could ever get the bleeping lid off. Mr ShoeThatAlwaysFits recently caught me desperately trying to twist my way into one, too proud to ask for his assistance. He watched me for a second, then calmly wrangled the jar away from me and told me that there was only one failsafe way to open them on my own. He set the jar down on the kitchen worktop then picked up a large sharp kitchen knife before flamboyantly and rather violently stabbing the lid, effectively breaking the air seal and allowing the jar to open sesame. That is now my second best kitchen trick. My favourite is saved for work. Never get between a demi-nerd and her coffee. I’m 5ft 3 and a hairs breadth tall – this means that reaching the top shelves in cupboards can be somewhat challenging. Our freshly ground filter coffee lives on the top shelf in our communal kitchen. I need coffee, the jar is empty, I can’t reach the refill bags – I could go and fetch a tall nerd to reach it for me, I could get a chair or a ladder to stand on. Neither is the most energy efficient way of dealing with this problem, I simply open the kitchen drawer and find the salad servers then pincer the coffee down to me. Quick and efficient and bypasses the smurf / hobbit / borrowers commentary. Working in a technology company means a lot of sitting around eating cake and drinking coffee. We feel guilty about this, especially on Bacon Sandwich Fridays when we phone our breakfast orders into a local cafe and they deliver them to our office. This is honestly the highlight of some people’s week. As part of our corporate responsibility initiative we’ve adopted a charity of the year and, feeling guilty about the cake, the bacon and the sedentary coffee consumption, we’ve signed ourselves up for a 30 day fitness challenge with all proceeds going to our chosen charity – this involves a yoga-esque pose called The Plank. This didn’t sound too scary – no running around and getting sweaty, you just hold one position for a set amount of time each day, even the Jedis amongst us could cope with that. Day 1 starts off easy enough, assume the position and hold for 20 seconds, by day 30 you should be able to plank for 300 seconds. There was a lot of over-confidence. The yoga practitioners smiled knowingly, everyone else went home and practiced before committing themselves to some public ridicule. I’m fairly fit, but I started shaking after about 40 seconds so I’m looking forward to the challenge. One of our business developers was openly honest – he had tried it and managed 4.7 seconds and informed us “he’s in it to win it”. Somehow, I don’t think so. One of our mega nerds asked if he could use some bricks or something to elevate himself as his tummy was still touching the floor when he assumed the correct position. We’re starting tomorrow, 1st February, there is a betting syndicate already set up with an odds-on favourite to win. Will I still be hanging in there on Day 30 – I hope so!